I think women are just wired for safety. We are always looking out for the safety of others and have a very healthy fear of “dangerous” things. Gun Safety for women is a natural fit. Now, don’t get cocky and think because we are naturally predisposed to being safe means that these gun safety rules or the practice of them are not required. It is! Actually, we as women shooters need to adopt the gun safety rules into every aspect of our lives as women gun owners. These basic rules codified by Jeff Cooper are universal. They apply to EVERYONE and they apply ALWAYS! No matter how experienced a shooter and no matter what the circumstances. ALWAYS. LEARN THEM, KNOW THEM AND SAY THEM EACH TIME YOU TOUCH A FIREARM. This gun safety rule must be your mindset. Any and all guns must be treated as if they are loaded. If someone hands you a gun and says, “Don’t worry, it’s not loaded,” do NOT believe them, no matter who it is. Whenever a gun is transferred from one person to another, have the owner remove the magazine, lock open the chamber, and show you the empty gun. With a revolver, have them open the cylinder and remove any rounds. When you accept the gun, assume the gun is loaded and check it yourself. Remember, there are no accidents, there is only negligence. Naturally, if Rule 1 applies ALWAYS, Rule 2 applies EVERYWHERE. Whether at the practice range, in your daily carry, examination or cleaning. A gun that is holstered properly, lying on a table, or stored properly poses no danger to anyone. It is only when handled that there is a risk. This rule of keeping the muzzle (front) pointing in a safe direction applies in self-defense, practice and daily handling. The muzzle of a firearm shall never point at anything you are not willing to destroy. If you are not willing to take a human life, do not point the muzzle at a person, including yourself! Do not allow the muzzle to point at your extremities, for example using both hands to re-holster your firearm. This is an unsafe practice. A well-designed hostler will accommodate one-handed holstering, so avoid holsters which collapse after withdrawing the gun. Safe Dry-fire practice with an empty gun at home is a good habit and highly recommended. Rule 3 is violated when any uneducated person handles a firearm. Since the hand naturally tries to work as a unit – as in grasping – separating the function of the trigger-finger from the rest of the hand takes effort. When drawing your gun, or picking it up, place your “trigger finger”, your index finger, straight along the side of the gun frame. 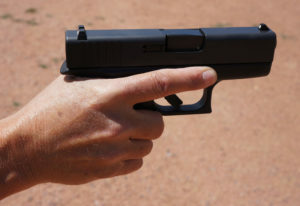 Do NOT allow your finger to move into the trigger guard until you have your target sighted. Never fire a shot unless the sights are superimposed on the target and you have made a conscious decision to fire. Allowing your finger to settle inside the trigger guard before you are ready to shoot is extremely dangerous. Once you move the gun sights off of the target, the trigger-finger leaves the trigger and straightens alongside the frame once again. Under stress, and with the finger prematurely placed on the trigger, an unexpected movement, misstep or surprise could result in a negligent discharge. This rule applies any time a gun is handled. Practice placing your trigger finger extended along the frame to help minimize the natural tendency to slide the finger into the trigger guard. Please remember that keeping your finger off the trigger is also required when posing for photographs. Know what your target is, what is in line with it, and what is behind it. Never shoot at anything you have not positively identified. Remember – in many cases, the bullet does not stop with your target and can pass through both interior and exterior walls. In self-defense situations, always be aware of what or who may be behind your target and then assess the risk of hitting an innocent bystander. You may need to adjust your line of fire to avoid hitting others. You must assess the deadly threat from your attacker with the deadly threat from your bullets to others. Be keenly aware of your surroundings, whether on the range or in a life-threatening altercation. Do not assume anything. Little do you know, but this insidious heavy metal found in ranges everywhere may be slowly killing you. ​-By Wm. Lane M. Robson, MD Dr. Lane Robson is the Director of Pediatric Nephrology at The Children’s Hospital, Greenville Hospital System, Greenville, South Carolina. He is a member of The Greenville Gun Club a..